This is my favourite side dish for dinner because it is not only nutritious, but it takes 20 minutes! Pair it up with your next barbecue or family dinner for a nice delicious change. Heat oil in a large saute pan over medium high heat. Add the garlic and saute until fragrant, about 30 seconds. Add the rapini and toss to coat in the garlic oil. Deglaze the pan with white wine and stir scraping any brown bits. 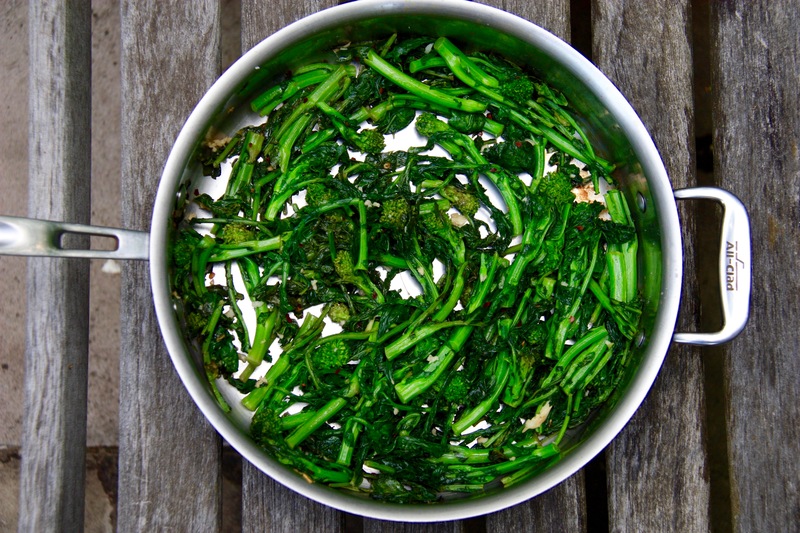 Add a splash of water to help cook the tough rapini. Saute the greens until they are a darker shade of green and the stems are tender to the bite. Season with salt, pepper and the chilli flakes. This recipe can be used for other greens like kale, swiss chard and even spinach!